Pastel blue and rustic brown semi-precious stones are amalgamated to create a Mosaic Table Top with an interesting visual appeal. The muted colors blend seamlessly into each other for a piece that is classically elegant. 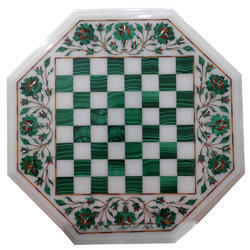 White Marble Table Top Malachite Inlay Gems Stone. Superior transportation facilities, efficient workforce and on-time delivery of the products make us stand out from the crowd. The company is backed by a quality control wing that includes skilled quality inspectors who strictly check all the products before delivery. We offer a wide array of Marble Inlay Mosaic Table Top available in various thicknesses ranging from 10mm to 30mm. The roundness Stone Mosaic Table Top of this circular table has been emphasized upon by geometrical design in different colors. Stones have been overlaid over the base to create a beautiful mosaic. 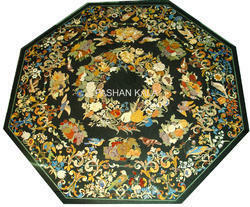 We manufacture these Marble mosaic stones table top using marbles and other stones. •Different sizes 12 to 60"
We are a renowned name, which is engaged in offering a wide and comprehensive range of Floral Table Top.